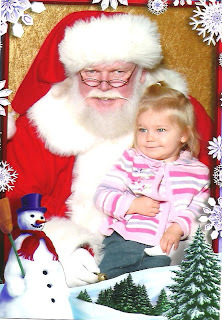 Today Olivia got to meet Santa Clause. She was a little wary of him at first, but she sat on his lap for this beautiful picture. Here Olivia is trying on some outfits that her Nana brought her. Helping Daddy put her new wagon together. This is Olivia with her reindeer hat that Santa gave her. Olivia and Daddy testing out the wagon. Olivia is really happy with it and now we will have something to cart the laundry in. A bonanza of pictures! We have to have Christmas each year just to remember how wonderful it is.